Check out the Toy Boxes! Crescent Heights Community Association is pleased to announce the Crescent Heights Community Park Toys! 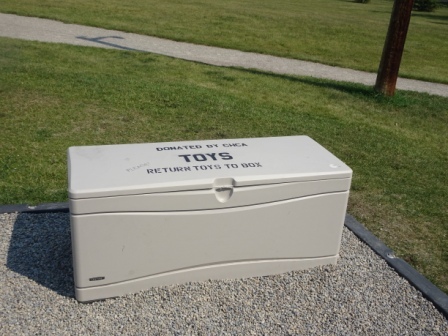 Thanks to a grant by the CHCA and with the ongoing support of the CH community, toy boxes have been installed in the playgrounds in Rotary Park and Crescent Heights Park to provide children with donated toys and games to enjoy while at the park. Please consider donating any outgrown gently used toys including toy trucks, shovels, pails, balls, playground games (think T-ball, orange cones for soccer, etc. 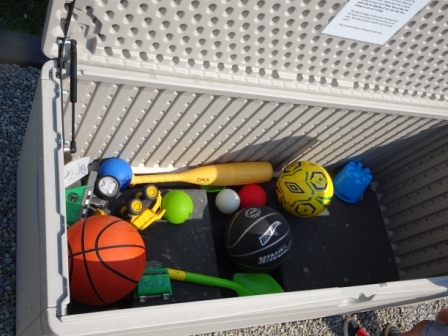 )… anything that can be safely enjoyed at the parks by kids of all ages. This is a community endeavor and any assistance in disposing of unsafe/broken toys is appreciated. Donations (clean) can be placed in the boxes anytime! Please return the toys to the box and clean up any sticky spills so others can enjoy the toys. We hope you enjoy the toy boxes!